As a manufacturer and distributor of quality label, etch, and microdot based products, DotGuard offers major dealer groups, agents and their dealers the opportunity to create private label theft protection programs for use/sale through their F&I or service departments. DotGuard labels are available in a range of styles, colors, and formats to suit each dealer and can coded with data unqiue to the dealer. 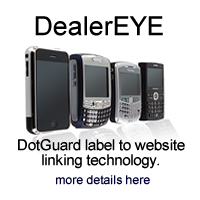 Using DealerEYE technology, DotGuard labels may also be linked to a dealer website through a smartphone. DealerEYE is also available for dealership marketing programs. 1) Products are fully customized to suit your specific dealership requirements. 2) All labels are designed to comply with US Government, ISO, & Department of Defense parts marking standards. 3) All programs are backed with National Vehicle Registration for the life of the vehicle. 4) Complete online dealer management system for 24 hour support. 5) Products are available for use with your own theft warranty programs or use in conjunction with DotGuard warranty programs. 5) Labels are available in various substrate options including polyester, and vinyl acrylic with enhanced tamper evident designs. 6) Low cost, fast turnaround, very easy to apply, and highly effective. 7) Maybe combined with DotGuard window etch or microdot program to create a custom program.